The NFL season is only two games old, but what a difference for the Cleveland Browns as compared to just a year ago. At this time 12 months ago, the Browns were sitting at 0-2 after dropping games to Miami and Baltimore. Quarterback Brandon Weeden was hurt, and with the team realizing that Jason Campbell was not the answer no matter how many times they rephrased the question, the coaches turned to an unproven Brian Hoyer. The bombshell dropped during the week between the second and third game, however, when then-team President Joe Banner traded away starting running back Trent Richardson, turning the Browns running game into what statistically would be the worst in franchise history and effectively punting on the 2013 season. In the days since the trade, many Browns fans have taken delight in Richardson’s struggles in Indianapolis, for reasons we are still not clear on. Richardson was never a problem – on or off the field – while in Cleveland. His biggest crime is that he has not improved his game at the NFL level from what it was in college at Alabama, which puts him in the company of many players that entered the league before him. Fast forward a year and while the Browns may only be one game better in the standings (we’re actually starting to worry that the Pittsburgh loss will haunt the Browns later in the season), the perception surrounding the team is that they are clearly in a better place. After leading a game-winning drive against the Saints, Hoyer has taken hold of the starting job (much to the chagrin of CBS, Fox and ESPN). The win was one of the biggest at home in years as it not only broke a streak of home-opening losses that dated back to 2004, but sent the home crowd into a frenzy of anticipation for this week’s game against Baltimore. The running back trio of Ben Tate, Terrance West and Isaiah Crowell have already rushed for three touchdowns (compared to four all of last season), have three runs of more than 20 yards (equaling last year’s total), and are averaging 152.5 yards per game (good for fifth in the league) compared to just 86.4 last season (27th in the NFL). It should only take a couple of more games for someone to surpass Willis McGahee’s “leading” total of 377 rushing yards from last season. 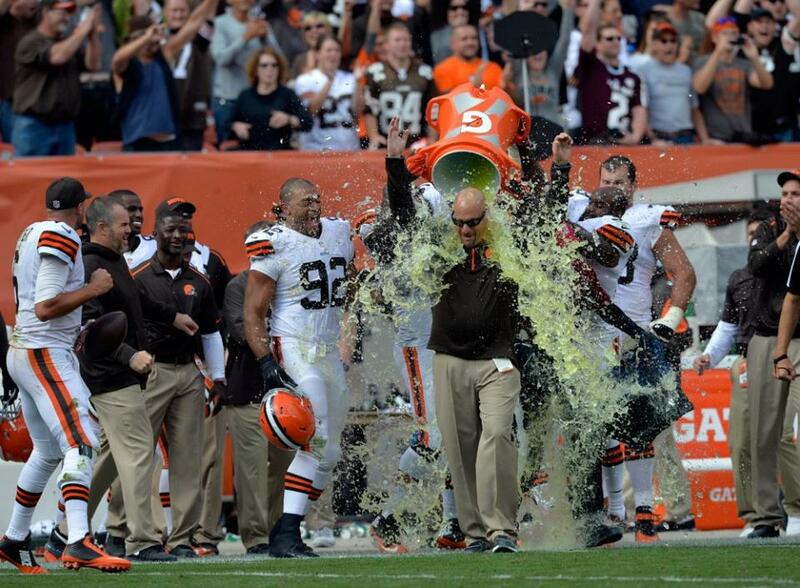 The Browns also have a first-time head coach in Mike Pettine who somehow doesn’t come off as a first-time head coach. The early season excitement makes the upcoming game on Sunday even more important. It’s a division game, meaning a loss would drop the Browns to an unattractive 0-2 in the AFC North before the season’s quarter mark. With the bye week following the Ravens game, the Browns need a strong showing to keep everyone energized. The worst thing that can happen on Sunday is for the team to really struggle, giving the media and fans two full weeks to over-analyze everything wrong with the team. While a win would obviously be the optimum outcome, even a close loss where the Browns show they can compete with the Ravens (think the second half against Pittsburgh) would be good enough this early in the season. Knowing that the team still has a ways to go, Pettine tried to downplay the game against the Ravens a bit, but you can tell he understands the importance of the Browns not being the division’s punching bag anymore. “We don’t really get into the past other than we looked briefly at the history here so our guys know what we’re dealing with, but previous struggles in the division – that has no bearing on this game, just like what happened this past Sunday has no bearing on this game,” Pettine said on Monday in published reports. “I think we have to have that ability to close that noise out so it doesn’t become a self-fulfilling prophecy like, ‘Hey, we’re not supposed to be good in the division, therefore we won’t be.’ I just think that we know it’s a little bit extra when it is a division game, and I just think it’s important for us to play well in the division. A lot has changed for the Browns since this time last year. Sunday provides the next opportunity for the team to show that the change is more than just perception.